I'm back in business. I went a couple days thinking that I had lost my touch. Today was a little different. We fished the White River for 4 Hrs.and landed 12 Brown Trout. 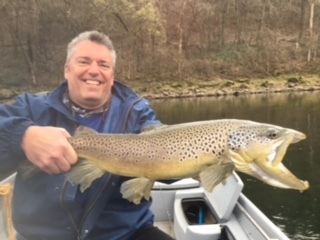 Most of the browns were 18-20 inches but we had one 26" fish. I was in the White Hole area fishing with minnows. The fish were a little hard to put a hook in. We missed as many as we caught. Hopefully the one day streak will continue tomorrow.